I still find myself using DataTables (from SQL Server, mySQL, etc.) on a regular basis. 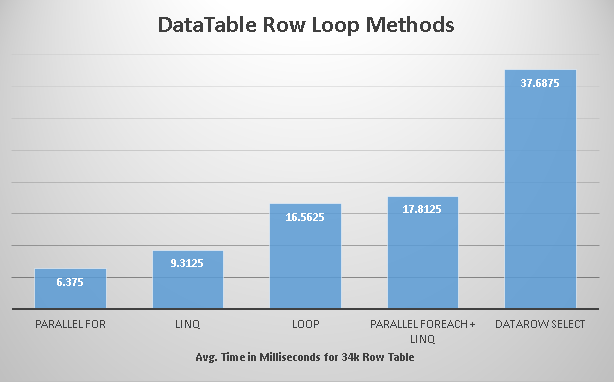 In an effort to see how some different methods of looping through the data performs and what method might be the fastest, I put together some small, fast tests, below are my test results. My sample data was comprised of about a 34,000 row datatable – running these tests on a i7, 32gb, VS2015 setup. The 34,000 was chosen because a box of Froot Loops contains about 1800 Froot Loops (I think), but 1800 was too small, so how about 18 boxes of Froot Loops?